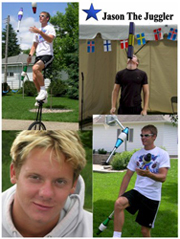 Comedy juggling show best described as a combination of Stand-up Comedy & Juggling or Stand-up Jugging. Priam is playing diabolo for 14 years, he performs 2 cabaret acts : a highly-technical diabolos performance and a visual performance in the dark with UV lights and luminous juggling props. CREDITS: Local television stations, many large festivals and fairs. 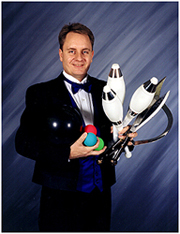 Young energetic performer with 8 years and 400 appearances all over the United States. 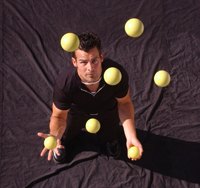 Whether Ivan is blindly kicking a flaming torch over his head, juggling ping pong balls using only his mouth, or having you laughing hard, his show will change your mind about juggling.